As your vehicle goes through a turn, its outside wheels will travel farther than its inside wheels, meaning they’ll be spinning at a different speed. If your wheels were directly connected by a solid axle, turning your car would cause wheel hop and very unstable handling. The differential is the drivetrain component designed to solve this problem. Differentials are fully encased sets of gears filled with a lubricating fluid located between your drive wheels. They work by transferring your engine’s power to each drive wheel while also allowing the drive wheels to spin at different speeds as you are cornering. Action Gator Tire is proud to offer expert differential maintenance, repair, and replacement services in the South and Central Florida areas. We’re here to help you keep your differential properly lubricated and working well for a safe, smooth driving experience. Whether your differential needs a fluid change, a rebuild, or a full replacement, Action Gator is your trusted partner. With expert teams of ASE-certified mechanics and 29 locations in the Orlando, Ocala, Tampa, Ft. Lauderdale, and Sarasota, FL areas, we’re here to handle all your differential service needs. Front-wheel drive and rear-wheel-drive vehicles have a single differential or transaxle located between the drive wheels. All-wheel-drive (AWD) and four-wheel-drive (4WD) vehicles have two differentials, one between each set of wheels. No matter how your vehicle is configured, your differentials need proper lubrication and cooling. Over time, the lubricating fluid filling your differentials will wear out, so it’s important to change your differential fluid on the service schedule suggested by your vehicle’s manufacturer. At Action Gator Tire, we specialize in draining and flushing differentials, inspecting their gears and shafts inside for excess wear, and then refilling them with fresh lubricant for smooth, reliable function. Over time, your vehicle’s differential will experience intense amounts of heat and friction. As your differential fluid breaks down, it will allow the gears and shafts inside the differential to wear, break, or even seize up altogether, leaving your vehicle undriveable. 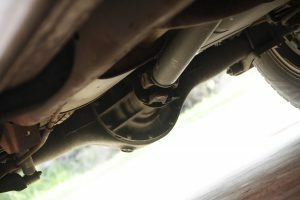 Regular fluid changes and inspections will help prevent these types of major issues, but eventually, your differential could need to be serviced, repaired, or replaced altogether. Symptoms of a failing differential include excessive noise, increased friction, and poor power delivery. If you’re experiencing any of these issues, your local Action Gator Tire will be happy to help. We’ll check every piece of your differential, fix and replace any parts that need it, and rebuild it all to work like new. We can also do a full differential replacement, if needed, to keep your vehicle running efficiently for many miles to come.